% BIG SUMMER PROMOTION % GET SKRWT NOW FOR AT LEAST 50% OFF! 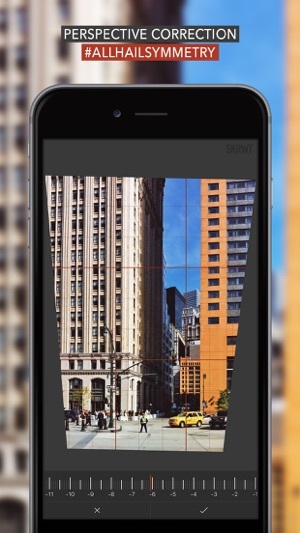 SKRWT (App Store's "Best Apps 2014") is the most powerful perspective- and lens correction tool out there. 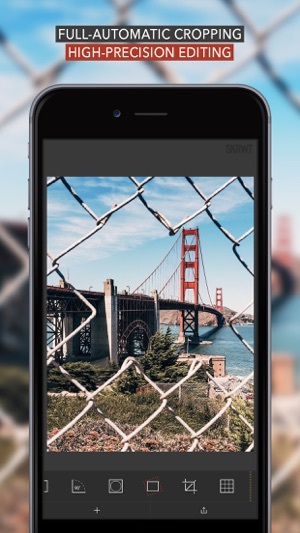 Crafted to help you enhance your best smartphone photos in just a few taps, v.1.3 of SKRWT is now better than ever. 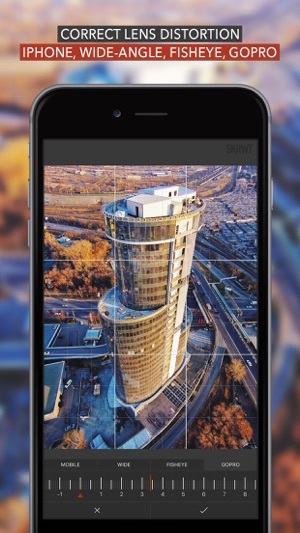 With a variety of unrivalled features and awe-inspiring in-app extensions MRRW and 4PNTS, this fine application is the go-to editing tool for sophisticated photography enthusiasts like yourself. All hail symmetry! Kiss converging lines goodbye: SKRWT is the all-purpose perspective and lens correction app for symmetry lovers. Correct horizontal and vertical lines as well lens distortions for shots taken with adapters, DLSRs, with a GoPro or a drone camera. 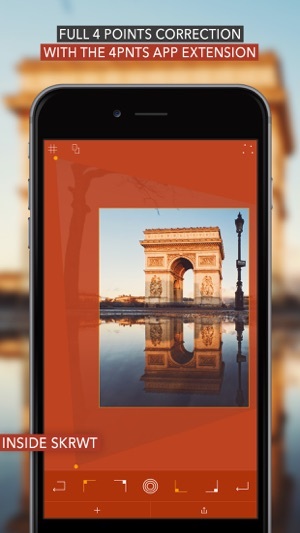 With the one-of-a-kind full auto-cropping functionality and the self-explanatory, intuitive user interface, SKRWT is the missing link in high-end smartphone photography. 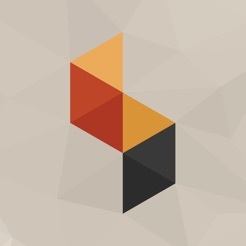 If you are a sucker for quality and symmetry, SKRWT is for you. With 4PNTS, the good folks at SRKWT re-thought perspective correction workflows and put together a new must-have extension. A hands-on approach to professional photo transformation: 4PNTS lets you manually work one or more corner points of your image, turning perspective correction into a fully intuitive manipulation process. The 4-point-perspective-tool is available as an in-app purchase – so you get to artistically transform, skew and enhance your photos within SKRWT. Your individual take, your creativity, your shot. 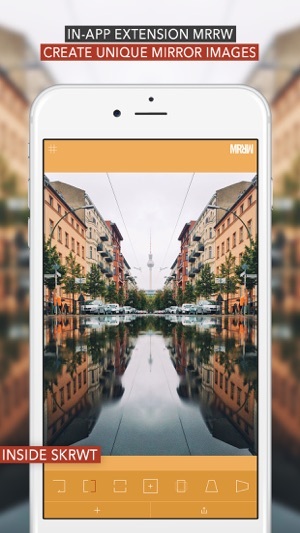 SKRWT presents four high precision mirror effects in this unmatched mirroring tool for your smartphone. With a refreshing approach to creative image manipulation, MRRW helps uncover the hidden symmetry in your best shots and enables you to find new creative and artistic freedom. Explore new possibilities in composition and use perspective correction and auto cropping in SKRWT-quality. Here goes for a never-ending stream of MRRWGRAMS! Hey there - you good? Hello from the SKRWTeam! With this update we are taking care of some little things and get the big things going! This isn’t a massive update, but an important one. And by the way: SKRWT x MRRW x 4PNTS is currently on a big summer promotion (at least 50% off) until July 16th - please feel free to share the good news with us! Hey there! This sounds interesting and we'd love to help! Could you please send us an email to hello at skrwt com so we can have a look into that? You are the first one to report this issue so we hope we can make it work without any further problems. I bought the app, but I need to pay more to save the photo! As for the functions, the same functionality is in a dozen of free applications.